Although I am not religious, I think church architecture looks stunning; the sheer scale and commitment involved in designing such builds is truly astonishing. Last week, I went to the Catholic church in Croydon to admire the craftsmanship. The ever growing church was given the honorary title of Croydon Minster in 2011, and is dedicated to St. John the Baptist; aims to 'become a centre for pilgrims seeking to connect with our local heritage'. The church dates as far back as 960 C.E. at the time of the Anglo Saxons, but most of the architecture is Medieval. Or at least Medieval in style. Much of the building was destroyed by a fire in 1867, and the tower, south porch and outer walls are the only original parts to remain. The entrance to the nave is a grand sight, with angel corbels sculpted into the supports, mosaic tiled flooring, and light sparkling through stained glass windows. To the right is the baptismal font, which quite fittingly is surrounded by children's toys, making it immediately clear that this is a very family oriented church. Croydon Minster has strong links with the Archbishops of Canterbury, six of whom are buried at the church. The first was Edmund Grindal; as a moderate Puritan, he was forced into exile when Mary I took the throne. Grindal later returned and became Archbishop in 1575, but had a rock relationship with Queen Elizabeth I, who had him removed from office. The second, and probably most famous in Croydon, was John Whitgift. He set up the Whitgift Foundation, providing care for the elderly, and building three schools, which have over three thousand students today. The third Archbishop was Gilbert Sheldon from 1663-1667. His tomb was once much bigger, but was damaged in the 1867 fire; it was later restored in 1959, but on a small scale. The other Archbishops include William Wake, John Potter, and Thams Herring. The church has four choirs: The Choir of Men & Boys, The Girls' Choir, Schola Cantorum, and Croindene. They give four choral services each week, perform at concerts regularly, and have even been broadcast and recorded. When at the Minster, they sing to a four-manual organ that was built in the 19th century by William Hill. At the high altar you'll find a alabaster reredos depicting Jesus Christ on the cross. 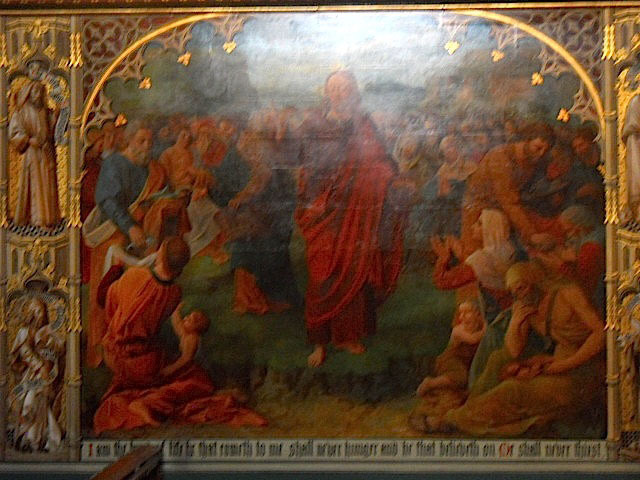 There is a second reredos in the St. Nicholas Chapel, which shows Christ at Emmaus with two of his disciples. Also inside the chancel area is a Victorian fresco of the Feeding of the Five Thousand, and a sedilla, which is an ornate seating area for priests during the Eucharist. Aside from services, the church is open to visitors between 10am-4pm Sunday-Wednesday & Friday, and 10am-1pm on Saturdays.